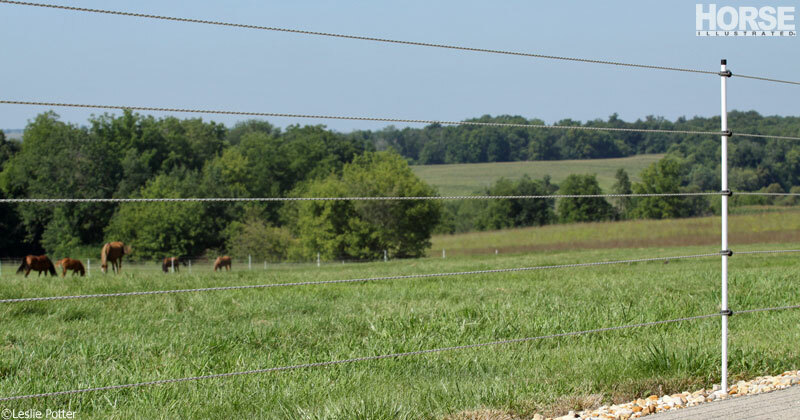 Find the horse-safe fencing option that works best for your farm. 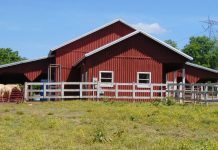 There are so many details to think about when choosing a new boarding facility or when bringing your horses home, but some choices should be non-negotiable for the safety and well-being of your equines. Among these non-negotiable stipulations should be the type of fencing. 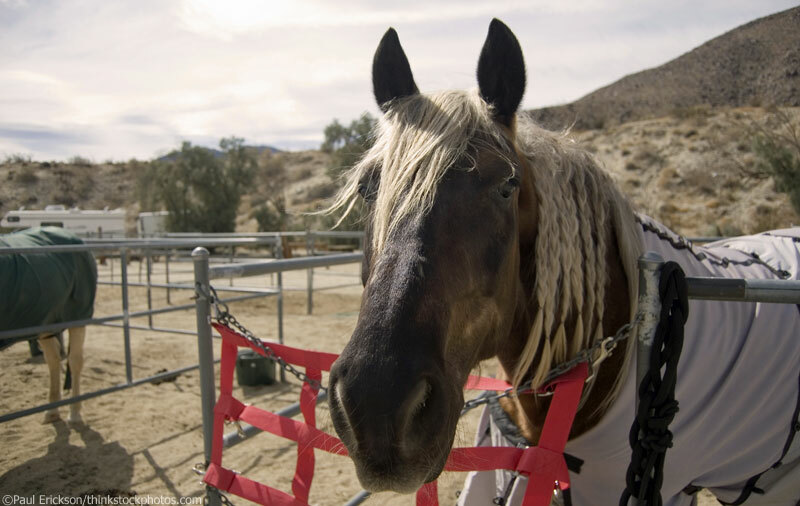 Some fencing is simply not safe for horses under any circumstances; these include barbed wire and large, square mesh. Barbed wire can easily entrap a panicked horse that tries to run through it or jump over it, ripping hide and doing career- and life-ending damage to tendons and other internal structures it exposes. Fencing made of square mesh should ideally have openings of no more than 3 inches square; any larger and you risk trapping a hoof in the fence. If you’re putting in fencing on your own property, there are quite a few factors that come into play during the decision-making process, including terrain, budget, aesthetics and maintenance. All fences should be between 4 ½ and 5 feet tall (at minimum) to safely contain horses. 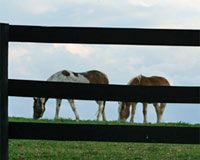 The bottom part of the fence should be 6 to 8 inches off the ground, which will prevent foals from rolling out of the field (if you have them); it will also discourage horses from sticking their heads under the fence to graze. Highly visible and strong, wood fences can be expensive to install and can require a lot of maintenance. 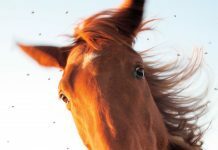 Weather and horse teeth can take a toll on even the most well-constructed board fence, necessitating regular repair and replacement of boards. Woven wire is one of the more inexpensive options for fencing, though it is recommended that the visibility of this fence be improved by using a top board or electrified tape at the top. This will also discourage horses from leaning on the fence. V-mesh wire (also called no-climb fencing) is one of the safest fencing options out there. 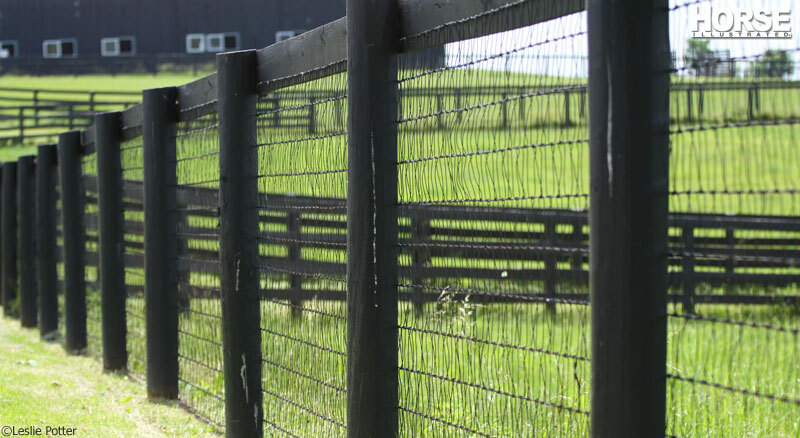 This type of fence has a diamond pattern that makes it as effective at keeping animals out as it is in keeping horses in. The downside is cost; it is the most expensive wire fence. Smooth wire fences, though inexpensive to construct, are some of the most difficult fences for horses to see; because of this, smooth wire used for horse pastures is usually coated with white PVC and used with some sort of electric (either tape or a hot strand) to keep horses from leaning on it. While very visually pleasing, PVC fencing is extremely costly and is designed to break under pressure. It’s a good idea to use some type of electric fencing in conjunction with PVC fence as horses will soon learn that the boards will give if leaned on. 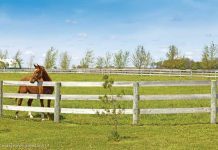 Though pipe steel fences are strong and durable, there is no “give” should a horse run into it. Transport and labor to install this type of fence can be high, and, once installed, modifications are difficult to make. Electric fencing can be used by itself or in conjunction with almost any other type of fence. Electric wire and tape are inexpensive, yet they increase the effectiveness and longevity of other fencing materials by preventing horses from leaning or chewing on them. It typically takes only one run-in with a charge to keep horses away from fencelines that are hot. 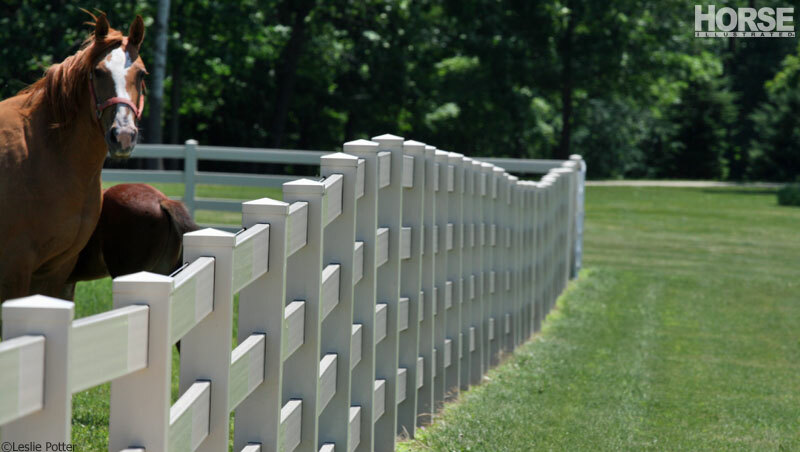 No matter what type of fencing you choose, the safety of your equines should be your No. 1 priority. I used to work on a stud farm in Yorkshire, England, and we used to use the French tape system really good and light and easy to put up. I have wooden and electric fencing. I am looking to switch to Vinyl. It has a 10 year Guarantee and is durable and safe! Its not listed in the article however. Great article. But I hate electric fencing. Any reason that you don’t mention the RAMM, Flex Fencing? It’s a shame you didn’t include Finish Line fencing. We have it on our farm; it’s the absolutely best horse fencing out there. Safe, easy to install, and maintenance free. What about RAMM PVC strap fending? That’s what I have with an electric rope at the top to stop my horse from pushing the posts out. I love this stuff and I found it to be reasonably priced. Had it for 10 years and minus a little mildew (I have the white) it still looks awesome! Not the safest horse fencing on the market, Flex Fence? Thanks for sharing. Is it possible to integrate the electric fence style with an automatic gate?